Please sign up to the conference on the link below. NOTAA are in need of 4 more UK registrars to participate in this year's Residents Day. Please contact Gwen via the e-mail address on the flyer. You can be from any region in the UK. 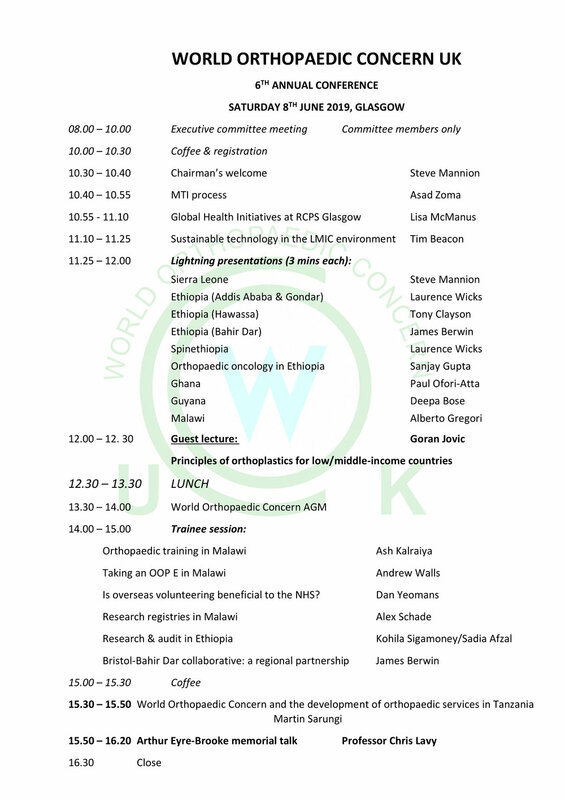 WOC-UK continues to look for more volunteers to support training of orthopaedic residents in Ethiopia. We aim for a minimum of 6 pairs of individuals to travel to Addis Ababa each year, ideally for at least two weeks at a time. Often the visiting pair will consist of a senior consultant and someone earlier on in their career. We are able to pair people up if required. Currently there is funding available to support those who take part in this training link (£500 per week of a trip per person). Please register your interest by completing this form. We are accepting abstracts for podium presentations on Orthopaedic work conducted in low and middle income countries (LMIC) or work done that is applicable to a LMIC setting. Deadline 31st March - contact deepabose@yahoo.com for more details. NOTAA is an established voluntary organisation committed to supporting training and infrastructure development in Hawassa, Ethiopia and Blantyre, Malawi to enhance the development of trauma services in Africa. NOTAA aims to improve hospital facilities, medical and nursing skills, surgical operating environment and orthopaedic surgical equipment. NOTAA has full charitable status with its own fundraising account as a recognised and approved subgroup of World Orthopaedic Concern (WOC UK). The Ethiopian Residents Day is an event held to celebrate the collaborative work of Ethiopian Orthopaedic Residents and Trauma and Orthopaedic (T&O) Registrars in the Northwest. The aim of this scheme is to pair T&O Registrars from the Northwest of England with Ethiopian Residents (mainly working in T&O) to facilitate collaborative projects (audits/research). The pair will communicate online to discuss, plan and carry out a small project. This collaboration is expected to last up to 3 months. The project will be presented at the Residents Day in March 2019. Orthopaedic trainees in the Northwest can take part. Orthopaedic trainees who are situated elsewhere in the UK are also welcome to participate following approval from their program director. The Residents Day is supported by the Programme Directors in Ethiopia (Dr. Biruk Lambisso and Dr. Worku), the Programme Director of the Northwest Deanery (Mr. Jaysheel Mehta), NOTAA, The John Charnley Trust, World Orthopaedic Concern (UK), and AO Alliance Foundation. The Trauma and Orthopaedic Specialty Advisory Committee have recently published new guidance for training programme directors on long and short term work overseas during training. The 4th annual WOC-UK conference is being held at Wrightington Hospital on the 10th June 2017. Conference dinner, Friday 9th June 2017. £26.50pp. Please liaise with Liz Newton (nota4africa@gmail.com) by sending her a registration for and payment. The Africa Clubfoot Training Project, led by Prof Chris Lavy, is attempting to raise £100,000 to deliver clubfoot training to healthcare providers in Africa, with the aim of transforming the lives of thousands of children across the continent. This is an 'all or nothing' fundraising campaign, so we will only receive your pledge if we reach our minimum target of £70,000 by 4 December 2016! For information about the campaign including a link to the donation page, click the link below. Any questions can be directed to the team. Email clubfoot@ndorms.ox.ac.uk or phone +44(0)1865737543 . Wrightington Conference Centre, 10th September 2016.